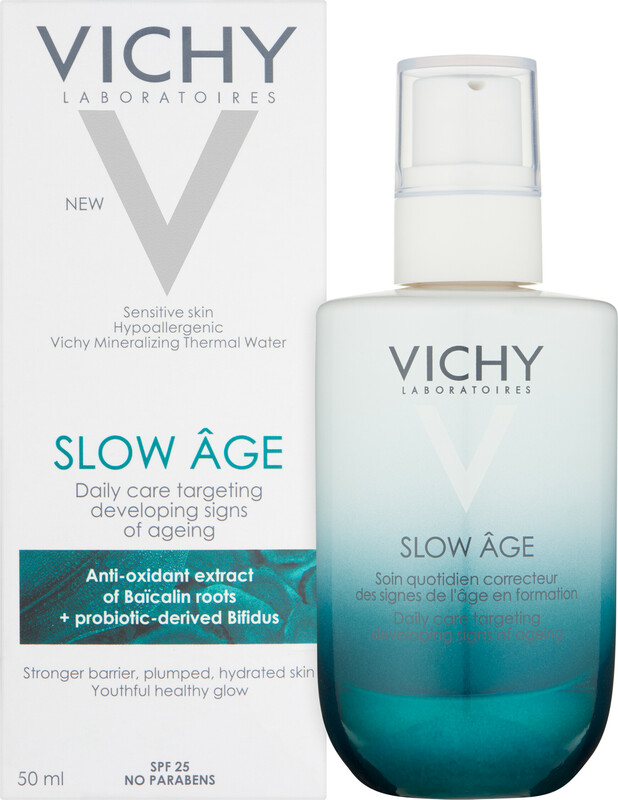 The Vichy Slow Âge Daily Care Fluid Moisturiser will keep skin looking and feeling its best day-after-day, its revitalising formula offering protection from the elements with anti-UV protection and an added SPF of 25. Enriched with a combination of naturally-inspired active ingredients, including antioxidant baicalin and probiotic-dervied bifidus, the Slow Âge Fluid will keep skin plumped, as well as reducing the appearance of pores and pigmentation over time. After use, skin feels hydrated, fresh and glows with health and vitality. Vichy Slow Âge Fluid SPF25 50ml is rated 4.3 out of 5 by 3. Rated 5 out of 5 by KateNi from Excellent product Amazing morning moisturiser, very lightweight especially since it has 25 spf..leaves the skin velvety..I LOVE IT!!!! Rated 5 out of 5 by AnnieH from Great everyday moisturiser with cosmetic benefits I use this with the Mineral 89 serum as a base and have to say I am really pleased with the results. Immediately upon application my skin looks better, the slight pinky pearlescent properties of the cream work to improve the appearance of the skin, so much so that you don't necessarily need much in the way of make up over the top (and I do not have anywhere near perfect skin). Even now in the depths of winter I find it moisturises enough throughout the day and does not leave skin shiny. I will be interested to see how well the SPF functions once I start spending more time outdoors again. Nice packaging too though not practical for travel and the lid is a little snug. Quite a few people have commented that it stings in the eyes but I cant comment on that as I've never got it in them, if you do you are probably using too much product!! Rated 3 out of 5 by beeznees from modern moisturizer Sorry, but I didn't like this much. I think this is for a much younger skin and not a 70 year old! It is highly fragranced and sits on the skin for quite some time. Vichy is a great brand which I've used for many years but this particular product didn't connect with me.